In addition to U.S. politicians, I began writing to world statesmen (the gender exclusion is deliberate because I didn’t know any world stateswomen except Eleanor Roosevelt and, if you will, Jacqueline Kennedy). I wrote to the Pope (as reported earlier), Charles DeGaulle, and Winston Churchill. Aside from a note from the pontiff’s secretary I heard from none of them. Later I learned that Churchill was fragile with advanced age and had retired from routine correspondence. I wrote to Pakistan President Ayub Kahn and India Prime Minister Jawaharlal Nehru, in part because they were visible in the U.S. media as President Kennedy sought to align their nations with the so-called free world. I never heard from Ayub Kahn, but many months after I wrote to Nehru I received a tattered brown envelope from India. The letter had traveled by surface mail, suggesting it had been on a boat for several weeks. Inside was a small card engraved, “With Compliments,” and a photograph autographed by Nehru. 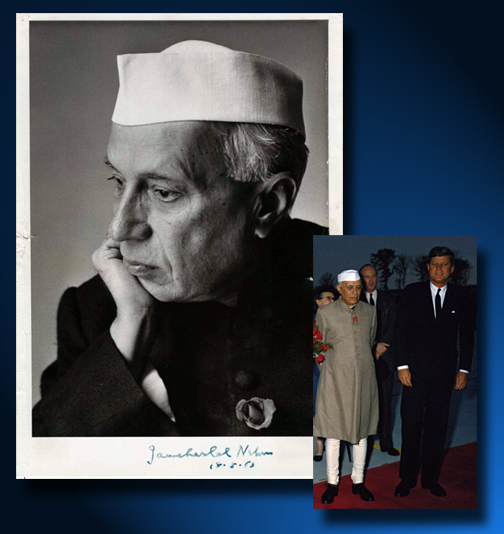 At 16, I knew little about Nehru beyond the fact that President Kennedy treated him with great respect. In the book Odyssey of a President by Merriman Smith, a report of President Eisenhower’s 1959 visit to several friendly nations, a memorable passage described the Prime Minister standing next to Eisenhower in an open car that was slowed by welcoming crowds in its path. Nehru, Smith reported, jumped out of the car and began pushing people out of the way. That alone would have earned respect from any U.S. president. Many years later, when I worked for the U.S. National Council of Churches, a colleague from India made a reference to “the first prime minister of India,” omitting his name because he assumed no American would know who he was. But perhaps my friend was wrong. I think a lot of Americans know Nehru was Mahatma Gandhi’s primary lieutenant, and the architect of modern India. I have few possessions I value more than the photo on which he scrawled his name and the date, 18-5-63. Nehru’s health was in decline by then, and he died a year later on May 27, 1964. Even so, he was evidently managing both the impossibly large and incredibly small duties of his office — including writing his name for an American teenager he never met.